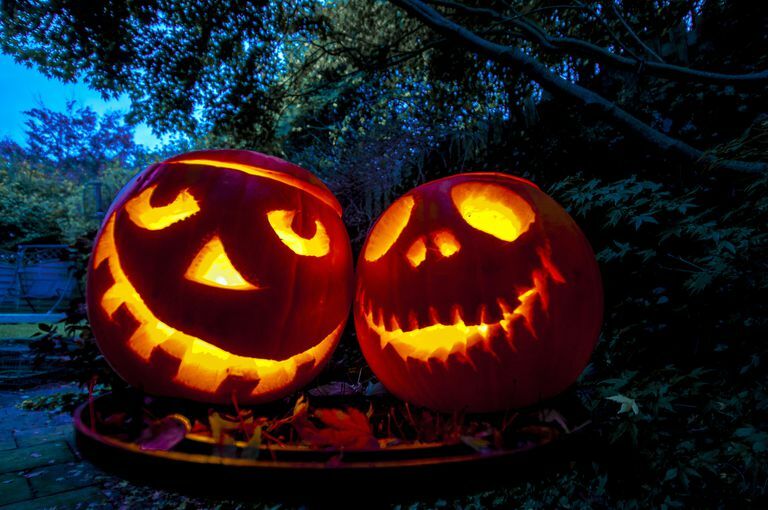 One of the most enduring symbols of Halloween is the jack o'lantern. Carved pumpkins are a mainstay of the Samhain season, and for some folks, the more elaborate the carved design, the better! A jack o'lantern typically holds a candle (you can also get battery-powered tealights, which are a lot safer) which illuminates the carved out design. School children are alternately delighted and terrified by them–but how did the whole idea of carving up a pumpkin evolve in the first place? Some authors have claimed that the idea of a hollowed-out vegetable with a candle in the middle originated with the Celts. However, the Celts didn't have pumpkins, which are a North American plant. They did have beets, turnips, and other root vegetables. Have you ever tried to hollow out a raw beet? It's quite an experience, for sure. However, there have been a few finds of vegetables with carved faces, which are spectacularly creepy. Although they are carved on the surface, they are not hollow. In addition, scholars say it's pretty unlikely that the Celts turned many of their vegetables into decorations, because they were too busy saving them to eat during the cold winter months. So the tradition of the jack o'lantern as a Halloween decoration is probably a fairly modern invention, by historical standards, although no one has been able to figure out exactly when it began. As mentioned, the pumpkin is a vegetable known primarily to North Americans. The native tribes here used it as a source of food for years before white men even set foot on their soil. Verlyn Flieger, a professor of comparative mythology at the University of Maryland, told LiveScience that "originally they were simply pierced to emit light, and were carried to scare away the spirits from the Otherworld who could enter the mortal realm." As settlers left Ireland and the other Celtic lands, they brought their traditions with them to the new world. However, turnips, potatoes, and root vegetables were in short supply. Pumpkins, on the other hand, were readily available, in addition to being easier to hollow out. Flieger said, "Gourds were scarce in the New World and turnips even scarcer, so pumpkins became the veggie of choice." The first example of the jack o'lantern appearing in American literature is in an 1837 story by Nathaniel Hawthorne, who wrote The Scarlet Letter. The carved lantern didn't become associated with Halloween until around the time of the Civil War. In many cultures, there exists what is known as a "Jack story." These are basically a series of folktales that revolve around a trickster-type character–Tricky Jack, Clever Jack, etc.–and usually start off with Jack getting in some sort of trouble. They always end with Jack resolving his problem, often at his own expense. In other words, a Jack Story is a typical cautionary tale. You can find these types of tales around the world, from Germany to the Scottish Highlands to the hills of Appalachia. In the case of the jack o'lantern, the story that inspired it is one in which Jack tries to outsmart the Devil himself. In the tale, Jack tricks the Devil into agreeing never to collect his soul. However, once Jack dies, it turns out he's led too sinful a life to get into heaven, but because of his bargain with the Devil, he can't get into hell either. Jack complains about how dark it is, wandering around earth with no place to go, and someone tosses him a hot coal, which he places in a hollowed-out turnip. Now poor Jack uses his turnip-lantern to guide him, and he is known as Jack of the Lantern. In some variations of the story, Jack comes out only on Halloween night, and is looking for someone to take his place... so watch out, if you see him wandering your way! The largest jack o'lantern on record was carved by Scott Cully of the Bronx, New York, in 2010. Cully used a pumpkin that weighed in at nearly 1,500 pounds. If you're entering a jack o'lantern carving contest, professional pumpkin carvers (yes, that's a real thing) recommend using an ice-cream scoop to get all the seeds out of the middle. John Greenleaf Whittier's poem The Pumpkin includes the lines Oh, fruit loved of boyhood! the old days recalling, When wood-grapes were purpling and brown nuts were falling! When wild, ugly faces we carved in its skin, Glaring out through the dark with a candle within! New York City's RISE of the Jack-o’-Lantern event features 5,000 hand-carved illuminated jack o'lanterns every fall. The town of Keene, New Hampshire, holds the record for the most carved jack o'lanterns lit at one time. In 2010, they had a whopping 30,581 carved and illuminated pumpkins on display.